Last night, I went to a panel discussion hosted by the Horn Group and Girls In Tech. 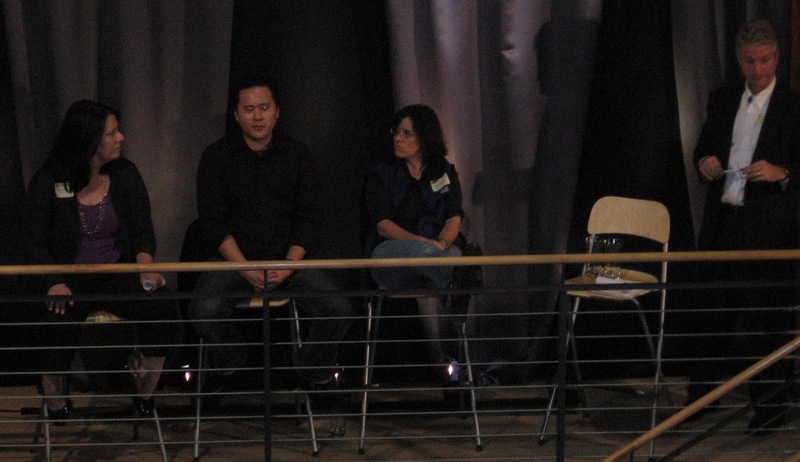 There was a star line-up of panelists: Jeremiah Owyang of Forrester Research and Web Strategist Blog, Kara Swisher of WSJ and All Things D, Susan Etlinger, VP of Horn Group and Sam Whitmore of Media Survey as moderator. The topic provided attractive with over 200 people packed in the Horn Group offices on Howard St. Considering the economic news swirling around me, the event reminded me a bit of the heady dot.com days – yes, I really am that old Virginia! Twitter tag #prblog. Sam took a quick poll of the audience before commencing with the Q&A. It seemed the audience was 60% PR folks, 20-25% Horn Group clients and other people interested in the topic from marketing/social media backgrounds. Kara Swisher – I’ve read her blog and hearing her in person was definitely more amusing! Deja Vu – Didn’t we see this 10 years ago? For a panel discussion that promised to be titillating, I found that it was bogged down by semantics of PR’s role in the social media landscape versus how the industry, as a whole, can better address this as a core competency. These were the same discussions that occurred 10 years ago with the rise of the Internet, which ironically was referenced when Sabrina pulled out a big, black binder about the impact of the Internet on PR. To paraphrase one audience member, what we’re referring to – Twitter, blogs, wikis, etc. – are just communications tools. In 5-10 years, these may be commonplace ways to communicate with your audience. While the panel was informational for those new to PR or currently struggling with PR’s value within the larger marketing and social media landscape, I think the panel didn’t truly delve into the question of the evening – Will Social Media Kill PR. I was sitting in the balcony where most of the social media folks were sitting. When Sam turned to us and asked if our issues were being addressed, frankly they weren’t and I said so (yes, that was me voicing the need to get beyond PR and talk about how this fits into the larger marketing arena). Unfortunately the discussion turned back to the basics of PR 101 meeting social media. In the end, I agree with Jeremiah. PR has a window of opportunity to leverage social media to build higher business value with customers and companies beyond a corporate communications capability. When the discussion evolves from which outlet can you get me in to one of what audiences do you want to influence, then PR will have a seat at the table. But hasn’t this always been the crux of the problem for PR from the beginning? Does social media really change that conversation? I don’t think so. What do you think? – Charles Cooper’s take – PR is Killing PR, not Social Media. – While Lewis Green wasn’t at the panel, he brings up a good point about the value of social media in PR. – Horn Group’s summary about their Is Social Media Killing PR panel. Starting a blog is easy. Getting and maintaining the motivation to post regularly is not. I originally started my blog in May 2007 as a way to discuss how PR is an integral part of marketing. I started writing one post a week, grew to two posts and then even did a weekly digest of interesting articles. As time passed, my posting became more irregular while work increased as well as the activities of life. On top of that, I’ve been struggling with what to write. I thought – I want to be original. If someone else wrote on a topic, why repeat it – I would just link to the post and put in my 2 cents as part of a weekly digest. I was amazed at the number of intelligent folks around me – Jason Falls, CK, Cam Beck, Chris Brogan, Todd Defren, Paul Dunay and more! What could I possibly contribute? Not writing for the past few weeks has allowed me to reflect and realize why I started blogging in the first place. The purpose of blogging is PERSONAL! It’s not about how often I post. It’s about writing something of VALUE to me and, in the process, this will help someone else. It’s not about writing what motivates others, it’s about writing about what MOTIVATES me. And maybe, this will motivate someone. So what does this mean? For me, my goal is to write posts that highlight what I’ve learned. To share any new insights that I have. And in the process, get to know about you while revealing more about me. As part of this process, I’m finally going to update my blog theme, so bear with me as I may make changes. Playing with different themes or maybe soliciting help for a more customized look. While I can’t promise to post often, I can promise that I will try to make my posts more personal. That they are of value to me, motivate me and contribute to the community.